Spotted Lanternfly is a new invasive insect, native to China, India, and Vietnam, that has been spreading throughout the Eastern United States since it was first discovered in Berks County, Pennsylvania in 2014. This pest poses a great threat to agricultural crops, forests, and high-value ornamentals. Since its discovery, there have been multiple quarantines in place for firewood and products shipped from Pennsylvania. Unfortunately, this has not stopped the spotted lanternfly from spreading to other eastern states. In 2018, the spotted lanternfly was spotted closer to our neck of the woods, in Cecil County, Maryland, and Winchester, VA. Experts say it’s a matter of time before the spotted lanternfly becomes a serious invasive pest in the DC metro area. In fact, our Arborists expect the first sightings in Northern VA will occur this year and are warning homeowners to keep an eye out for signs of this invasive species. How Does The Spotted Lanternfly Hurt My Tree? 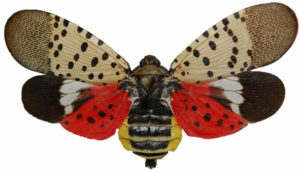 The spotted lanternfly causes damage by feeding on the trees. They are plant sucking insects, meaning they feed by sucking sap from the stems and leaves of trees and shrubs. This weakens the tree/shrub and eventually contributes to its death. The spotted lanternfly also leaves behind honeydew, a sticky clear substance which is the excrement of plant sucking insects. Honeydew attracts other insects such as ants and wasps and fungi such as sooty mold, which interrupts photosynthesis and stunts growth. On top of this, honeydew can damage car paint and create a sticky mess wherever it lands. As nymphs, the Spotted Lanternfly targets grapes, apples, stone fruits, pines, maple, willow, poplar, and tree of heaven (Ailanthus). As an adult, the spotted lanternfly mainly feeds on the Ailanthus (Tree of Heaven). Muddy-gray egg masses on the tree or on other flat surfaces (benches, car hoods, etc.). These egg masses hatch in late spring. Since this pest is new to the United States, researches, government departments, nurseries, and the tree care industry, are all working together to determine the best course of action to treat infected trees and limit the spread of the Spotted Lanternfly. As of today, the best prevention/treatment includes proactive removal of the host tree, egg mass removal, and insecticides. One of the ways to fight the spotted lanternfly is to remove the trees they feed on. Since the nymphs feed on a variety of tree species it’s not feasible to remove all of them; however, lucky for us, most adults prefer to feed and lay their eggs on one species of tree, Ailanthus, also known as the Tree of Heaven. This species itself is an invasive and is commonly considered a weed. Removing Ailanthus trees from your landscape will help keep the Spotted Lanternfly from spreading and benefits the trees that are native to the area. DC residents can even remove their Ailanthus trees without paying into the DC Tree Fund. 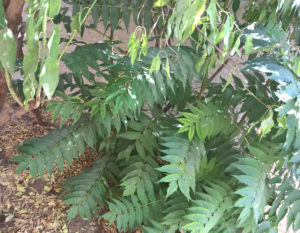 Residents must still obtain a permit but they can obtain the permit for FREE since Ailanthus is one of the few species exempt from DC Tree Fund laws. 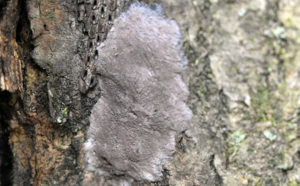 If you happen to find egg masses on your property you can keep your tree from being infested in the spring by removing the egg masses as soon as possible. Use a flat object (such as a knife or plastic card) to scrape egg masses off the tree trunk or whatever surface they are on. Seal the egg masses in plastic bag and dispose of them in the trash. You can also place the egg masses directly into hand sanitizer or rubbing alcohol to kill the eggs. If you do find nymphs feeding on your tree, we can help. Our arborist will use insecticides to fight the spotted lanternfly that are feeding on your tree. Depending on the population level and the lifecycle stage, our arborist may suggest certain types of insecticides and certain application techniques, such as topical or systemic applications. If you’re worried about Spotted Lanternfly or are starting to notice signs of the insect on your trees, schedule an appointment with one of our Arborists. They will be able to develop a custom plan to prevent and fight the spotted lanternfly on your property. Just give us a call at 703-573-3029 or book an appointment online.